I have been traveling a lot and that has caused a serious lack of recipe updates on Banaras ka Khana. I regret not posting all the recipes I keep cooking in my kitchen and many more recipes that I intend to post on the blog with an intention to revive them from the crevices of the past. Not just the cuisine of Banaras and eastern UP, I keep indulging myself with desi traditions from all over India and always wonder how similar ingredients and similar techniques make so many different flavours belonging to different states. I will tell you how I found Bhatt ka dubka from Uttarakhand to be similar to our matar ka nimona. Bhatt is black soybeans that grow locally all over Uttarakhand and probably in Himachal as well. 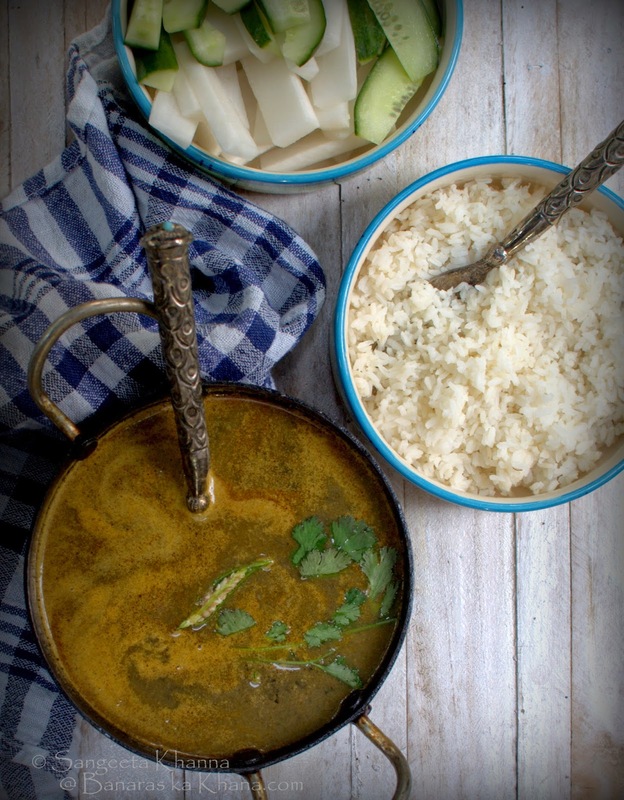 Bhatt ka dubka and bhatt ki chudkani is everyday food for all locals and it really is so rustic and tasty you would find yourself craving for it once you taste these. I was in Dhanachuli and Sattal (Nainital district, Uttarakhand) last week, the first 5 days were spent with the chefs at Te Aroha, training them to bake some continental dishes but I keep talking to them about their own cuisine on the side. There is so much to learn from every individual we meet. Later we went to Sattal for a birding trip for the weekend and roamed around the hills eating some local food (mostly alu ka gutka with pahadi raita) and shooting (with a camera) whatever birds we found. This is where I spotted a cart owner who had written 'Kumaoni dubka, bhatt ki chudkani and Jholi bhaat available here'. I promptly went to him and asked if these were available, you see I can go to any extent to taste any new kind of food belonging to the land I am visiting, I can taste something even if I have had my meal. This cart owner told me he cooks these only when there are local tourists and during summer vacations when there is more possibility to sell. But seeing my eagerness he offered to cook one of these the next day and we decided on a bhatt ka dubka. He kept his promise and cooked such a tasty dubka that I ate the dubka curry slowly to absorb the taste and asked the recipe from him. He happily shared the recipe and I decided to cook bhatta ka dubka on my return, I had some bhatt already in my kitchen bought from Navdanya or trade fair probably. And what a treat it was. He had served it with a side of pink radish batons, green chillies and few onion rings. All for INR 70. Here is the result of what I cooked. I am so glad I could recreate the dish, more because the taste was fresh in my mind, the recipe simple. I felt dubka is quite similar to our nimona where a lentil is made into a coarse paste and then cooked with spices and seasoning to make a curry. 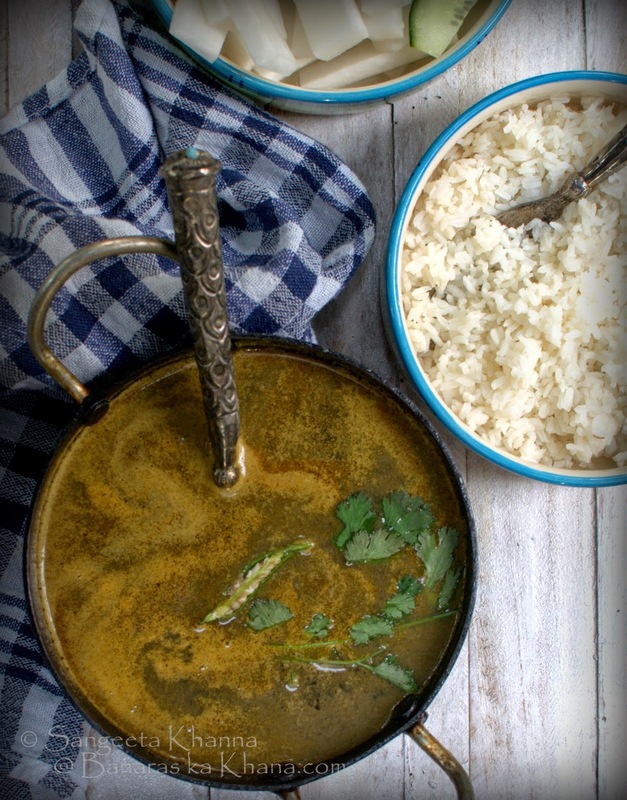 Similar to nimona, dubka can also be made using different types of lentils like gehat ki daal (horse gram), kala chana (black chickpeas) or even green mung or black beans (urad). 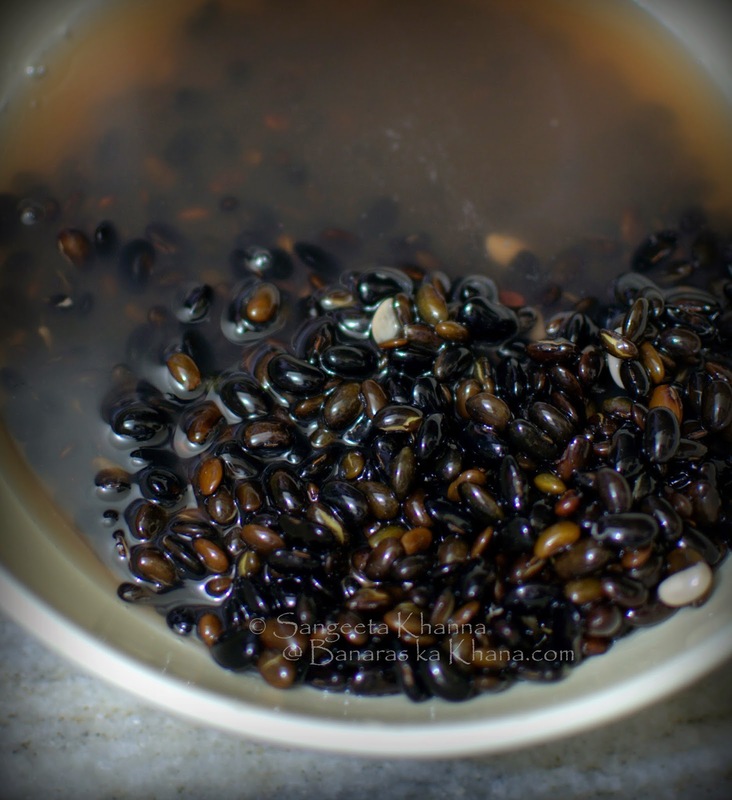 But this black soybeans or bhatt is something that lends a unique taste to this dubka. Everyone I asked, told me that bhatt ka dubka or chudkani both should always be cooked in lohe ki kadhai (iron or cast iron utensil) and that it should be cooked for every long. I observed the locals in Uttarakhand make their recipes really simple with only a few steps. They would preferably stone grind all the onion, garlic etc as well as the spices and then bhuno them all together in mustard oil. Even the bhatt (the lentil) will be stone ground on silbatta (mortar and pestle). The preferred cooking utensil for this bhatt ka dubka is lohe ki kadhai (iron pan) and I followed this detail. But I ground the spices in my electric blender. First make a really coarse paste of the soaked daal, using very little water and keep aside. Grind the onion, garlic, ginger, chillies and all other spices together in blender till smooth, adding little water as required. Make a paste of tomatoes if using and keep aside. Now heat oil in a cast iron kadhai and tip in the spice paste. Bhuno the paste till it starts leaving oil or gets aromatic. Small quantity of oil being used doesn't result in separation of oil while bhunoing but the masala mixtures starts looking glazed. Add tomatoes if using and salt as well, bhuno a little more. Now add a cup of water to this mix, add 4 cups of water to the bhatt paste and pour to the cooking mixture. Let it come to boil once and keep stirring till then. Now lower the flame to minimum and simmer the bhatt ka dubka for an hour or more. I cooked it for an hour and half and the taste was really rich, the curry dark brown due tot he iron kadhai used and flavours really deep and warm. 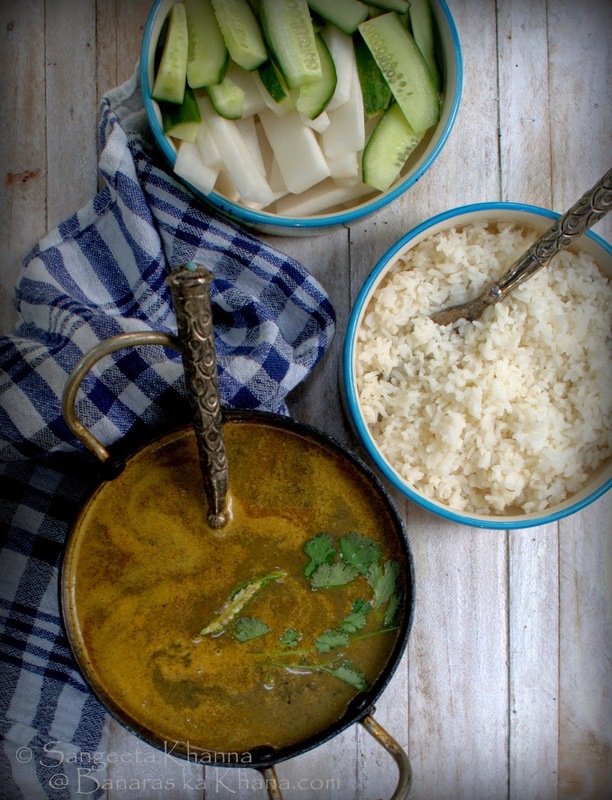 The real companion to the bhatt ka dubka is plain boiled rice (preferably short grain) and some batons of radish, cucumbers and few onion rings. Nothing else is required and you would find yourself eating loads of those radish (mooli) and cumber batons. Some green chillies can also be served along especially if they are not too hot to bite into. What is a countryside meal without some pyaz-hari mirsc-mooli on the side. For my meal it has to be more bhatt ka dubka, less rice and loads of mooli and kheera on the side. 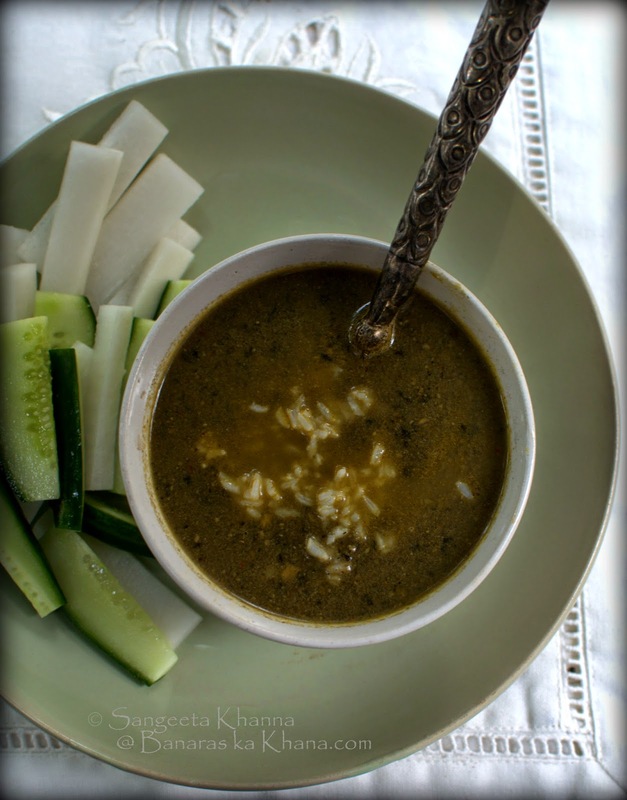 Totally a satiating meal that is light on the stomach and very nourishing too. Very rustic and warm in flavours and spirit. Are you trying this bhatta ka dubka? Some people make masoor or toor daal ka dubka with a few deep fried pakode in it, just like kadhi is cooked but I wont bother with any other dubka once I have tasted bhatt ka dubka now. Hello! Thanks for this recipe. I have a stock of bhaat ki dal and was wondering what to do with it. I'm definitely going to try this. Hey !! Glad you share this recipe here. There's one more method of preparing dubka.... soak d daal overnight and grind it . Then add little oil in kadahii preferably lohe ki (iron). Bhuno this daal till all the water dries ... then add water . Add spices like salt , laal mirch, dhania powder and garam masala ... no haldi. Take few spoons of chawal ka aata (rice flour) mix it with little water and add it to the boiling dubka daal .Let it come to boil once and keep stirring till then. Now lower the flame to minimum and simmer the bhatt ka dubka for an hour or more. Thanks for one more recipe of Bhatt ka dubka Akriti. I am going to try this one too and update the blog.